Here are some pictures of my passionflower. I thought you would all enjoy seeing this exotic beauty. It's the most unique flower I think I have ever seen. 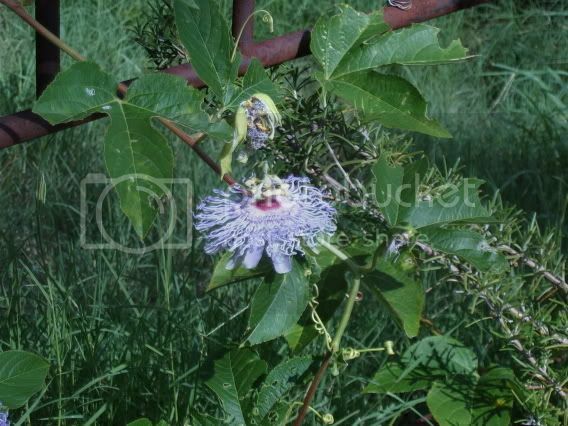 It's passiflora incarnata, known as Maypop, passionflower or passionvine. Oh Dave ~ that is so lovely! Thanks so for sharing it with us. Can you also tell us a bit about its care requirements? I like your passionflower. I had one a few years ago. I couldn't keep it through the winter. A very nice member here sent me one a few weeks ago. It is just getting some leaves. I can't wait till it blooms. Is yours climbing a bed frame? Nifty. Yep, Diane, that's a bedframe. Which kind is yours? I think some are more tender than others. This one grows in the wild here. Merme...there's not much to their care. They tolerate poor soil, drought, etc.I'm sure they'd benefit from P and K, but I haven't fertilized this one. I've had it for three years or more, I forget. There's an interesting thing about these. They're the only host there is for the Gulf Frittilary and Variegated Frittilary butterflies, meaning their larva feed on only this vine. Since I garden for the butterflies, too, I let them eat all the foliage. Notice the bits of leaves missing? The plants are adapted to this, so they can tolerate it. Several generations of butterflies can hatch from the larva. The vine also produces passionfruit, which tastes a little like a mild, sweet lime crossed with cantalope, or slightly like a kiwi. Very tasty, but it doesn't produce many. Pepper - what zone are you in there? I got a 6 inch cutting of one a year ago May, and it grew well last summer outside and then like gangbusters indoors, but I've yet to see a single flower. Is there anything I should be doing to encourage it to bloom? Does it have to be a certain age? I don't know about other varieties, but this one flowers a month or so after it emerges, and flowers continually, a flower a day per stem, usually, most of the season. I'd say give it phosphorous and hold out on nitrogen. They love full sun. I'm in zone 7. They call these maypops because they just "pop" out of the ground in May in most regions, and grow like crazy. Sue...I think it'll be fine outdoors in your region, but I'm not sure. Here, they just die back at the end of the season. Dave, my passionflower came fom member nmlAlba. She is in Malysia. They grow wild there also. You're in OK? What zone are you? I wish they would grow wild here. There is another plant for warm weather I like. Princess plant. I have an old bed frame in an old shed, handed down from inlaws who lived here before. I've been trying to figure out how to get it out. Ok now I see your post. Zone 7. That's not too far from zone 6 where I'm at. Oh well, do with what you have and be happy. I understand it's a year from seed. But I could be wrong. I started some earlier this year and am still waiting for the sprouts. I'm practicing patience lol. Ty for the pictures they are great. I have to kep it inside in winter dont I? If it grows.. I planted one stem of this plant in my garden in Indiana.....that one stem turned in to well over a hundred. I pulled and pulled I think it caused me more work the the actual weeds did in that bed it just kept growing, I think I even sent some to members last year. When I went home this year for the race, there it was all over the flower bed, it grows like crazy there. I was tempted to bring some starts home but was afraid they would take control of everything again. By far one of the most invasive plants I have ever grown. But those blooms wow soooo pretty and unique. Wow! Karrie, they must have really liked that flowerbed! Dodge...I've never checked what zone it's hardy to. tk...you might try nicking the seeds or sanding a spot on the coat. A friend did that with seeds and got good germination. I understand the fruit is an aphrodisiac. Any truth to this Dave? I was in zone 5b in indiana I believe, and I never took mine in and it was all over the place this year, and hubbys granny has had hers out side for years right up the road from me. They come back year after year. I have been trying to get the passion flower but no luck. they use grow wild around here. but can't find them anymore. Ask the lady from malayasia .. She will send seeds..
nmlAlba-dc15.........she is in Malaysia.. I dealt with her and it came in 7..
her name is Norhaini......see if you get a reply ..I did post one to her from me to talk to you. let me know if she gets to you..
maybe she will cause i don't know what i'm doing on here. i am new on here. See how we help each other?????? Were all buddies........Welcome to our FOrum, stay long and come often. I been taught a bundle on here......There are all sorts of forums, and questions galore..YOu dont see that in any newspapers.. It is a lot of fun , and entertains one when we have to stay inside. look i am looking for the starflower seeds. i planted some but i don't think they are coming up. i pm Adriel_135 but i think that was an old post. i seen where you trade with her before. what the seeds look like & where & when to get them. what the plant looks like when it starts growing. let see anything i forgot. o well i'll think on it awhile. how do you get the instant reply when someone makes a reply? Are you talking abut Borage??? Mine is growing beautiful......I will check an see if I have any of those left ..
Did I get those from Adriel? Quite a while ago. i have traded with so many folks, last 2 years and cant remember them all. However after mine go to seed, I will gladly share.......This is my first trip with them. I didnt even know what it was . I started them inside , about march.. ANd they are growing terrific form me in Penna.